Forget the association of the word “Gothic” to dark, haunted houses, Wuthering Heights, or ghostly pale people wearing black nail polish and ripped fishnets. The original Gothic style was actually developed to bring sunshine into people’s lives, and especially into their churches. To get past the accrued definitions of the centuries, it’s best to go back to the very start of the word Gothic, and to the style that bears the name. The Goths were a so-called barbaric tribe who held power in various regions of Europe, between the collapse of the Roman Empire and the establishment of the Holy Roman Empire (so, from roughly the fifth to the eighth century). They were not renowned for great achievements in architecture. 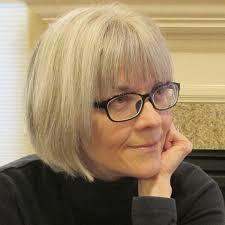 As with many art historical terms, “Gothic” came to be applied to a certain architectural style after the fact. The style represented giant steps away from the previous, relatively basic building systems that had prevailed. The Gothic grew out of the Romanesque architectural style, when both prosperity and relative peace allowed for several centuries of cultural development and great building schemes. From roughly 1000 to 1400, several significant cathedrals and churches were built, particularly in Britain and France, offering architects and masons a chance to work out ever more complex and daring designs. The most fundamental element of the Gothic style of architecture is the pointed arch, which was likely borrowed from Islamic architecture that would have been seen in Spain at this time. The pointed arch relieved some of the thrust, and therefore, the stress on other structural elements. It then became possible to reduce the size of the columns or piers that supported the arch. So, rather than having massive, drum-like columns as in the Romanesque churches, the new columns could be more slender. This slimness was repeated in the upper levels of the nave, so that the gallery and clerestory would not seem to overpower the lower arcade. In fact, the column basically continued all the way to the roof, and became part of the vault. 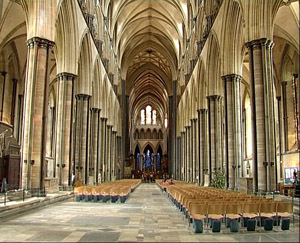 In the vault, the pointed arch could be seen in three dimensions where the ribbed vaulting met in the center of the ceiling of each bay. 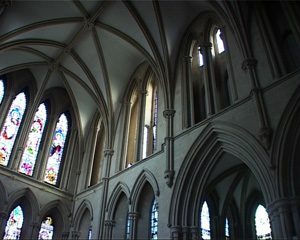 This ribbed vaulting is another distinguishing feature of Gothic architecture. 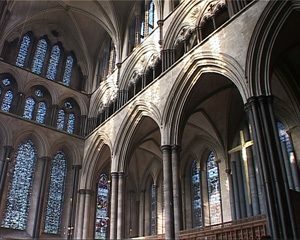 However, it should be noted that prototypes for the pointed arches and ribbed vaulting were seen first in late-Romanesque buildings. 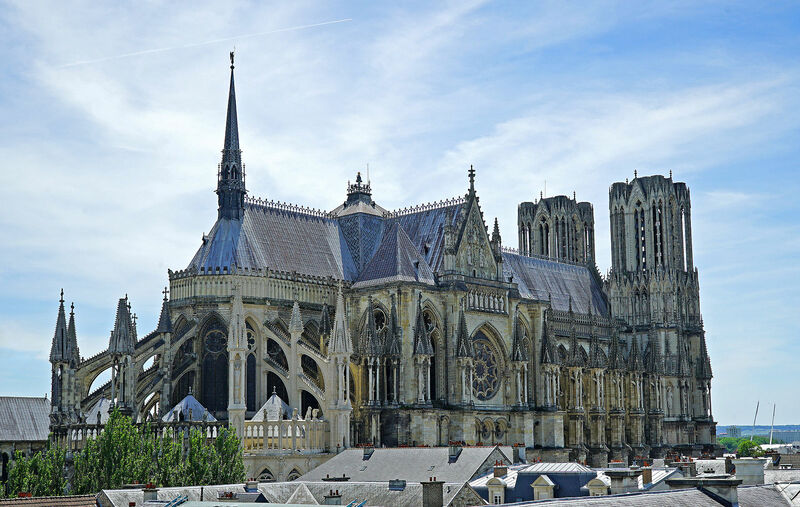 The new understanding of architecture and design led to more fantastic examples of vaulting and ornamentation, and the Early Gothic or Lancet style (from the twelfth and thirteenth centuries) developed into the Decorated or Rayonnant Gothic (roughly fourteenth century). 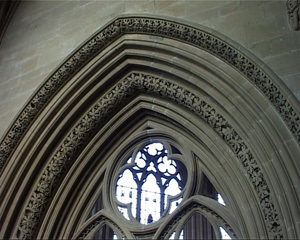 The ornate stonework that held the windows–called tracery–became more florid, and other stonework even more exuberant. 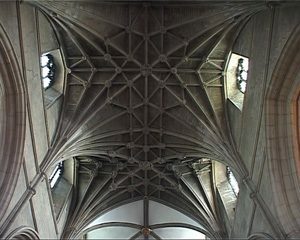 The ribbed vaulting became more complicated and was crossed with lierne ribs into complex webs, or the addition of cross ribs, called tierceron. As the decoration developed further, the Perpendicular or International Gothic took over (fifteenth century). Fan vaulting decorated half-conoid shapes extending from the tops of the columnar ribs. The slender columns and lighter systems of thrust allowed for larger windows and more light. 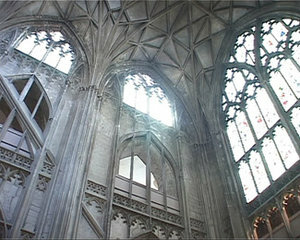 The windows, tracery, carvings, and ribs make up a dizzying display of decoration that one encounters in a Gothic church. In late Gothic buildings, almost every surface is decorated. Although such a building as a whole is ordered and coherent, the profusion of shapes and patterns can make a sense of order difficult to discern at first glance. After the great flowering of Gothic style, tastes again shifted back to the neat, straight lines and rational geometry of the Classical era. It was in the Renaissance that the name Gothic came to be applied to this medieval style that seemed vulgar to Renaissance sensibilities. It is still the term we use today, though hopefully without the implied insult, which negates the amazing leaps of imagination and engineering that were required to build such edifices. This entry was posted in Architecture, Art History, Gothic. Bookmark the permalink.